NASHVILLE, Tenn. – (May 21, 2014) –The Grand Ole Opry is set to host the 6th Annual Guitars of the Stars Benefit Auction at 4 p.m. Thurs., June 5 downtown at the CMA Music Fest Buckle Stage at 4th Ave. and Broadway. 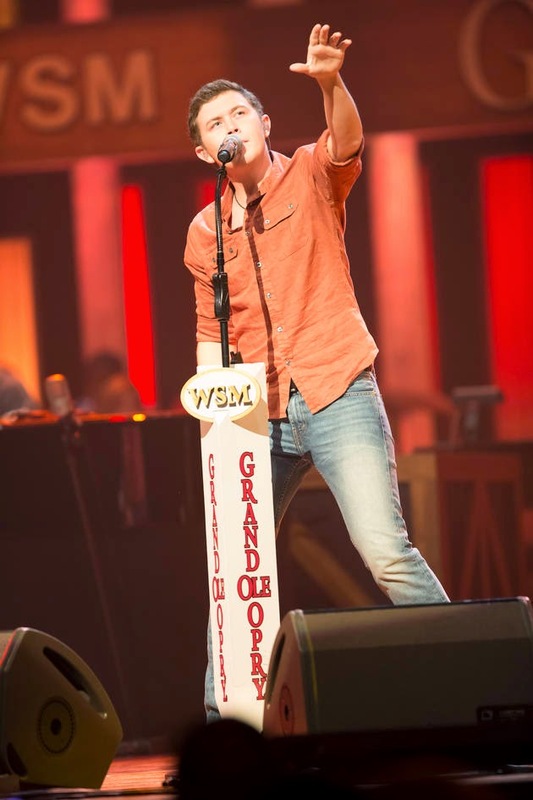 Mercury Nashville recording artist Scotty McCreery is scheduled to perform and guest host the event with radio and TV personality Bill Cody. The event is open to the public, and all proceeds from the auction will benefit the Opry Trust Fund, which assists members of the country music community in need. Acclaimed Nashville visual artists Lucie Rice, Amanda Sears, and Cindy Wunsch have contributed one-of-a-kind guitars both inspired and autographed by country favorites including Luke Bryan, Jimmy Dickens, Florida Georgia Line, Vince Gill, Hunter Hayes, Martina McBride, McCreery, the men of ABC’s Nashville, Reba, The Band Perry, Carrie Underwood, and Chris Young. Scotty will also be performing June 6th GREAT AMERICAN COUNTRY BREAKFEST SERIES DURING THE CMA MUSIC FESTIVAL.